I had my Roxy for 8 years and she needed to go to heaven with her daddy...I was heartbroken! I looked on the internet to see what I could do to bring up my spirits. And there he was, my Joey! He was lost in New Jersey, and the Burlington County Animal Alliance had him. I went to meet him and fell in love. He was a handful, but we managed. He is my best friend, he found me and I found him. We have gone through many ups and downs learning about each other, but we will make it! Joey is a mix, maybe shepherd? Don't know for sure, but I do know he is very smart and totally loyal to me. Life is good when a pet rescues you! Comments for My Pal "Joey"
Join in and write your own page! It's easy to do. How? 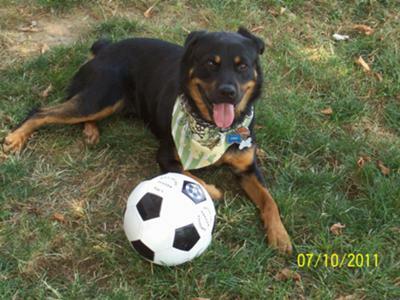 Simply click here to return to Rottweiler Adoption Stories.